A constituent asked me the following questions in email this week and I think the answers are worth pointing out. 1) Can you show me the studies that indicate there is a correlation between money spent per student and student achievement? It would be good to know that spending more money would get better results. I pointed her to the results of a study we did in 2008 – the Basic Education Financing Joint Task Force. We used the Washington State Institute for Public Policy to examine the research in education, try to weed out the questionable work, and quantify what we proposed and how it would affect student learning. I warn people that reading too much into the details here can lead to absurd results, but I think they did a good job. The results for our proposal, which is about a 40% increase in spending are below. More detail on their methodology is available in the actual report, available here. See appendix B. We update these estimates here. According to the Office of Superintendent of Public Instruction, the current high school graduation rate in Washington is about 72.5 percent. 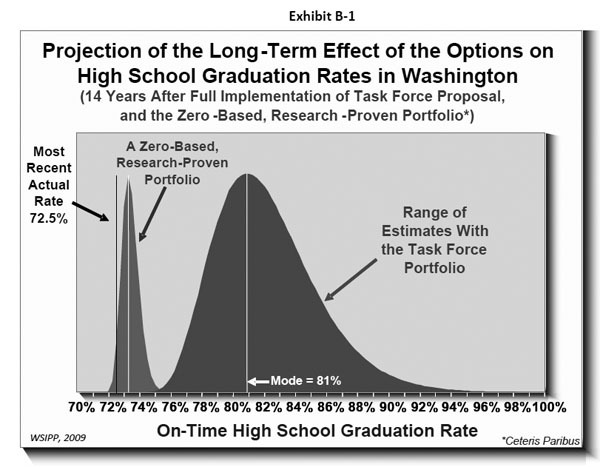 This is a cohort on time graduation rate.22 We used the procedures described earlier to project two estimates: how both the Task Force proposal and the zero based option could be expected to affect this rate. These effects are estimated 14 years after full implementation of the options to reflect the estimated long-run effect of investments in pre‐school and the other grades at the end of the education cycle in 12th grade. We project that the Task Force recommendations would increase the modal graduation rate to about 81 percent from its current level of 72.5 percent. Exhibit B‐1 plots these two figures and also indicates the significant amount of uncertainty around our estimated effect of the Task Force portfolio. The total area under the curve represents all cases from our simulation modeling. For example, in a small number of cases, the graduation rate could be expected to be much higher—over 90 percent; in most cases, however, it would be in the 78 percent to 84 percent range, with the modal case of 81 percent. The range largely reflects the underlying uncertainty in the expected effect of additional educational resources on student outcomes.